Street Mama is Garuda’s Mall’s newest bar and hang out spot. 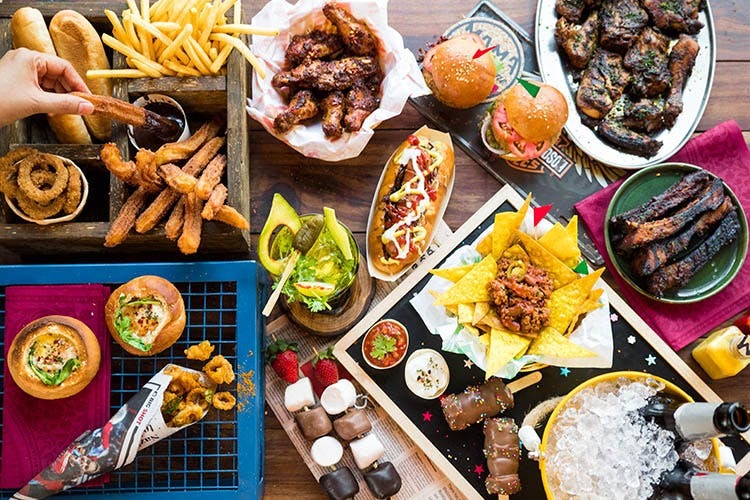 Themed around street food from around the world and dramatic drinks, does Street Mama come with legit street cred? Let’s find out. We’ve had our monkeys, frogs, owls and what not as pub names. Then came the papas, grannies and now mama. But you see the Mama in Street Mama is not a person (like your mom), but a “vibe” apparently. Hmmm, where have we heard that before? The entire space has sections divided into Mama’s Hood (for you to chill on comfortable wooden seating with a separate menu), Mama’s Pets, where a massive, colourful alligator (done by artist Amitabh Kumar) is perched against a blue brick wall. Our favourite seating was by the big glass windows, where you can see all of Magrath Road and the healthy competition across the road. The bar area is big and done up with fairy lights, tin mugs, mad colours and loads of cheeky mama-isms. But this is a place millennials are likely to flock to in droves, because it is exactly what they want. Plus, there’s street food from all over the world and gimmicky cocktails too. What more could you want? Hello Insta stories! The cocktails here are massive, mind you and you are supposed to nurse them spend some time over them (which also means that you don’t have to spend much on ordering several rounds of cocktails). But do go here with squad and order several drinks to share, because there’s high drama involved. From the big list we tried, we are gunning for the Guac Beer — yes there’s muddled avocado and jalapenos involved and lots of fresh coriander, topped with beer, and not too sweet. The Sea Sour served in a red pot with ice golas and roasted marshmallow came with hints of salt and caramel, while the Lost was a tequilla number with agave, white rum and cucumber flavours — really refreshing. We are giving the Betel Street a miss (paan and vodka just don’t mix) but the Jamaican Dah Ya Mama gets a thumbs up from us for its tropical beach holiday vibe and its spice laden, dark rum and pineapple flavours. Did we mention that a regular feature includes a street inspired drinks cart that will make the rounds to make special cocktails as per your demand. We tried mini cups of fresh mojitos (watermelon, classic, orange, etc) and loved the concept. The menu explores street food and is divided into dishes from the Americas, Europe, Africa, Asia and even Australia. We started with the very trendy Guac On Toast served on black bread with spicy avocado guac and feta. This was yum and was followed up by the fresh melon and feta salad. The Buffalo wings came with a sticky smoky barbecue sauce but we would have liked it to be spicier. But the Mini Tofu Poppers tossed in oyster chilli sauce were our absolute favourite. India gets representation with the Miyan Ji Ki Baida Roti (mutton and egg paratha squares) and Lakdi Seekh (Bhopali seekh kebabs cooked on sugarcane sticks). There’s also Kuku Piri Piri (grilled chicken slathered with the African sauce), pizzas (try the seafood one with shrimp squid and more). But we are showing loyalty to the homeboy Idli Sliders, steamed and slightly pan fried podi idlis filled with paneer (sounds weird but was great). Finish off with the Tasty videos-inspired Fruity Marshmallow Pops with banana, marshmallows on sticks or the Spanish churros served with three kinds of sauce — dark chocolate, coffee and creme caramel. We thought the churros could have been slightly less denser.